French exegete of the twelfth century; born at Beaugency, capital of a canton in the department of Loiret; pupil of Samuel ben Meïr, the eminent grandson of Rashi. 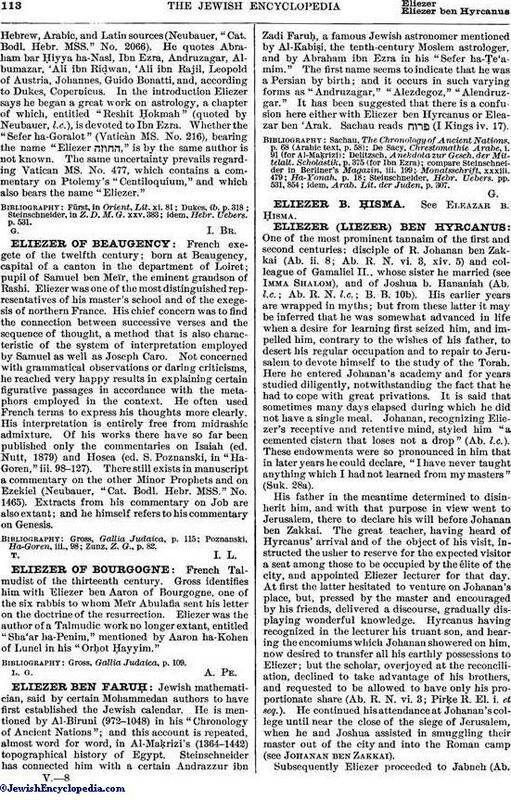 Eliezer was one of the most distinguished representatives of his master's school and of the exegesis of northern France. His chief concern was to find the connection between successive verses and the sequence of thought, a method that is also characteristic of the system of interpretation employed by Samuel as well as Joseph Caro. Not concerned with grammatical observations or daring criticisms, he reached very happy results in explaining certain figurative passages in accordance with the metaphors employed in the context. He often used French terms to express his thoughts more clearly. His interpretation is entirely free from midrashic admixture. Of his works there have so far been published only the commentaries on Isaiah (ed. Nutt, 1879) and Hosea (ed. S. Poznanski, in "Ha-Goren," iii. 98-127). There still exists in manuscript a commentary on the other Minor Prophets and on Ezekiel (Neubauer, "Cat. Bodl. Hebr. MSS." No. 1465). Extracts from his commentary on Job are also extant; and he himself refers to his commentary on Genesis. Zunz, Z. G., p. 82.